Friends, these are the chapter locations where you can volunteer to plant or support a chapter. Do you believe that our ecosystem is highly dependent on a natural balance? Do you wish to help maintain that balance in any way possible? Do you think a stable environment will be beneficial for our children’s futures? Reconnect with nature and wake your spirit up by being a part of this noble cause! 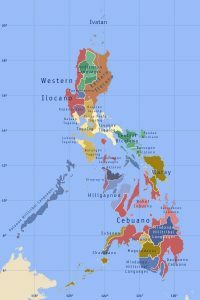 If you value our planet and the future of its inhabitants, come join us now and volunteer for one of the 30 tree-pinned lucky provinces and help make the world a better place for the future of humanity and the planet! Loving the planet that birthed us doesn’t cost too much, it is the time and dedication for the maintenance of our environment that will make the difference. To all our fellow human beings, let’s work together to hit that ambitious goal! Try to get people moving, involve them and help them realize that they are not separate from nature. No policies, no laws, no short lectures can teach people these virtues. 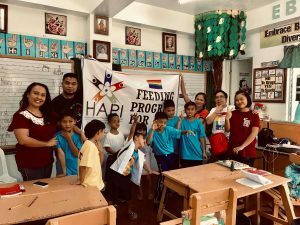 Awakening them to realize their oneness with nature through personal involvement and action are the best ways to get people to love the environment. These seeds will be symbols of our empathy and compassion, of our humanism and the spirit of service in the hearts of our every volunteer. These seeds will be symbols of hope! We had grown trees for the past 2 years and have grown new chapters as well for this year! 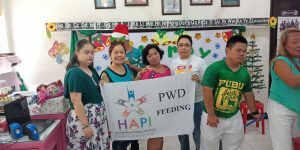 The gargantuan challenge of mobilizing all the willing volunteers is dependent on large amounts of funding. 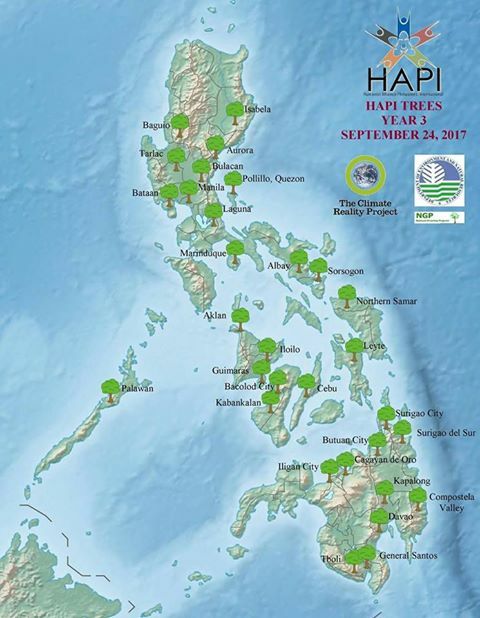 BUT we believe that volunteers, chapter parents and donors will make this year’s HAPI Trees possible once again. As of the moment we have 31 chapters. Each chapter would need funding for seedlings hauling/transport and sometimes site clearing and transpo of volunteers to the remote sites. Please help us get the trees planted. 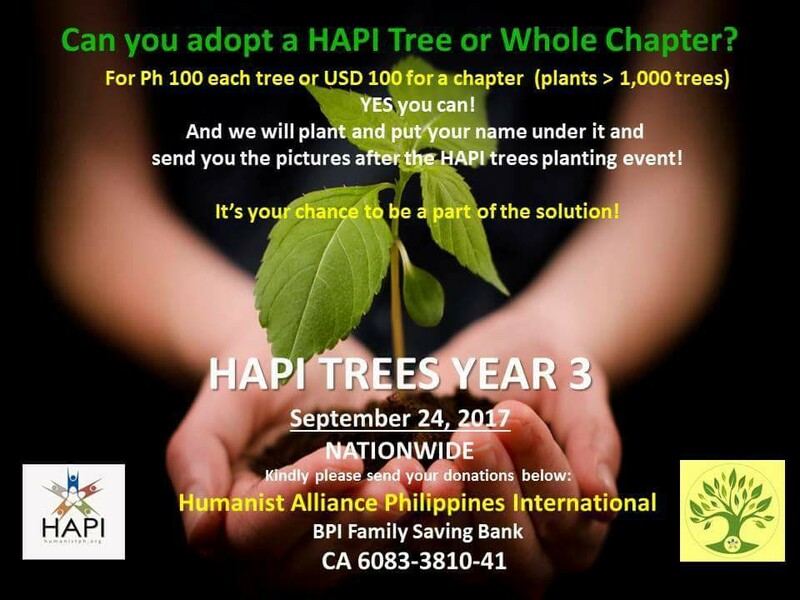 You can pledge for trees or adopt a chapter. So far, and in advance of this project announcement, we now have adoptive parents of 6 chapters! 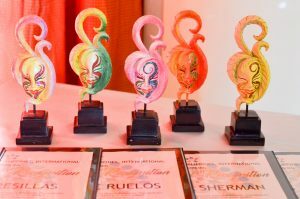 Namely; Leyte, Aurora, Baguio, Isabela, and two (2) more yet to be chosen yet by the donors. 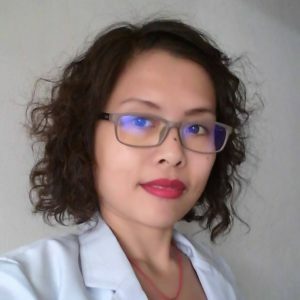 * We will dedicate the whole site for you, your family or company. Trees will greatly serve not only the localized chapter but everyone of us. Trees will hold the soil and ensure good water quality in the river as it prevents soil erosion. Soil erosion will also prevent landslides. Trees will protect us from the wrath of the storms. Trees can provide food and possibly shelter not only to people but also to birds and animals. Mangroves on the other hand will protect people living around the coastal areas and will encourage fishes to thrive. These wonderful things will save us and help us during these severe climate changing times. *Seedlings for the tree planting is free for volunteers in the provinces (just show up). 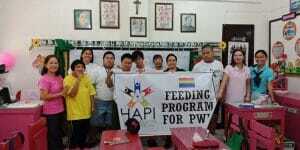 *100Php/pax (unli-planting) registration fee for Metro Manila volunteers. Please be a reason for these trees to grow. Help the volunteers mobilize. The amount of money we will spend on this is minute compared to the benefits we will have in the future. This is where the value of our money spent greatly pays off. This is an investment for our future. 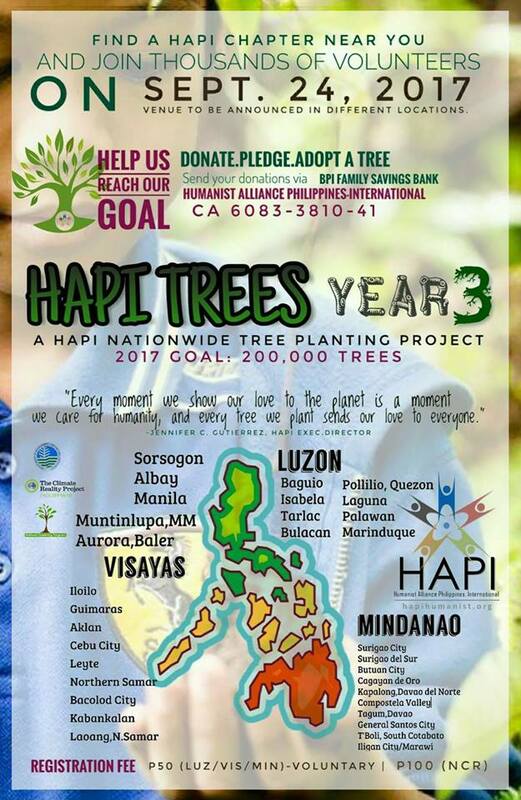 On behalf of the HAPI Trees Yr. 3 volunteers, we call upon your hearts to help us save our planet through trees and mangroves. *Other donation/payment options are available. Please feel free to ask us Thank you for your support.